It is true that I am nervous. 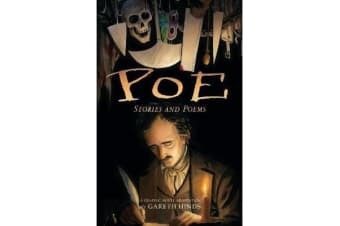 But why will you say that I am mad?In “The Cask of Amontillado,” a man exacts revenge on a disloyal friend at carnival, luring him into catacombs below the city. In “The Masque of the Red Death,” a prince shielding himself from plague hosts a doomed party inside his abbey stronghold. A prisoner of the Spanish Inquisition, faced with a swinging blade and swarming rats, can’t see his tormentors in “The Pit and the Pendulum,” and in “The Tell-Tale Heart,” a milky eye and a deafening heartbeat reveal the effects of conscience and creeping madness. 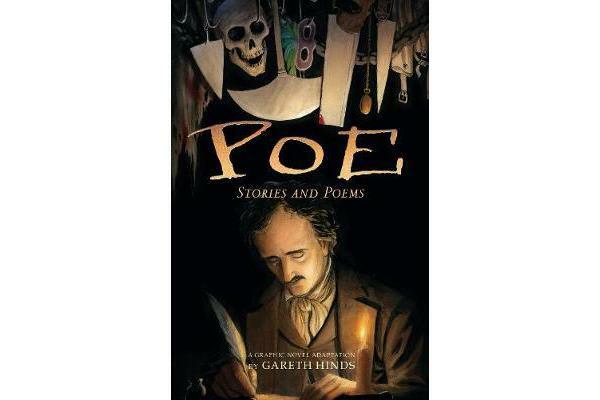 Alongside these tales are visual interpretations of three poems – “The Raven,” “The Bells,” and Poe’s poignant elegy to lost love, “Annabel Lee.” The seven concise graphic narratives, keyed to thematic icons, amplify and honor the timeless legacy of a master of gothic horror.